Female crickets have long since navigated to their partners using their songs. Now you can do it too. 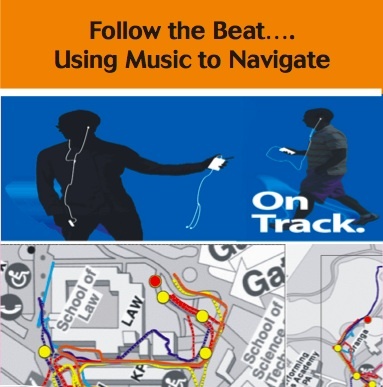 The OnTrack system developed at the Universities of Swansea and Waikato in New Zealand combines global satellite positioning with iPod music players to tell you where to go to the sound of your own music. The volume is increased or decreased to tell you if you are moving towards or away from target of your affection. The music is sent to the left or right headphone to guide you to the left or right. So join the fun, join the crickets and find your music mate.